CloudFlare is a company that provides content delivery network (CDN) and distributed DNS services by acting as a reverse proxy for websites. 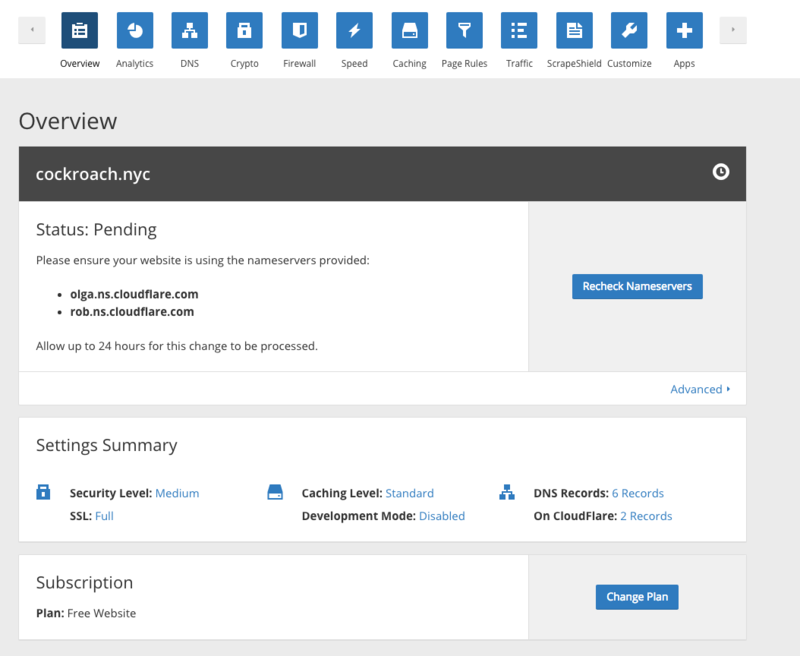 CloudFlare's free and paid services can be used to improve the security, speed, and availability of a website in a variety of ways. In this tutorial, we will show you how to use CloudFlare's free tier service to protect your web servers against ongoing HTTP-based DDoS attacks by enabling "I'm Under Attack Mode". This security mode can mitigate DDoS attacks by presenting an interstitial page to verify the legitimacy of a connection before passing it to your web server. You must also sign up for a CloudFlare account before continuing. Note that this tutorial will require the use of CloudFlare's nameservers. 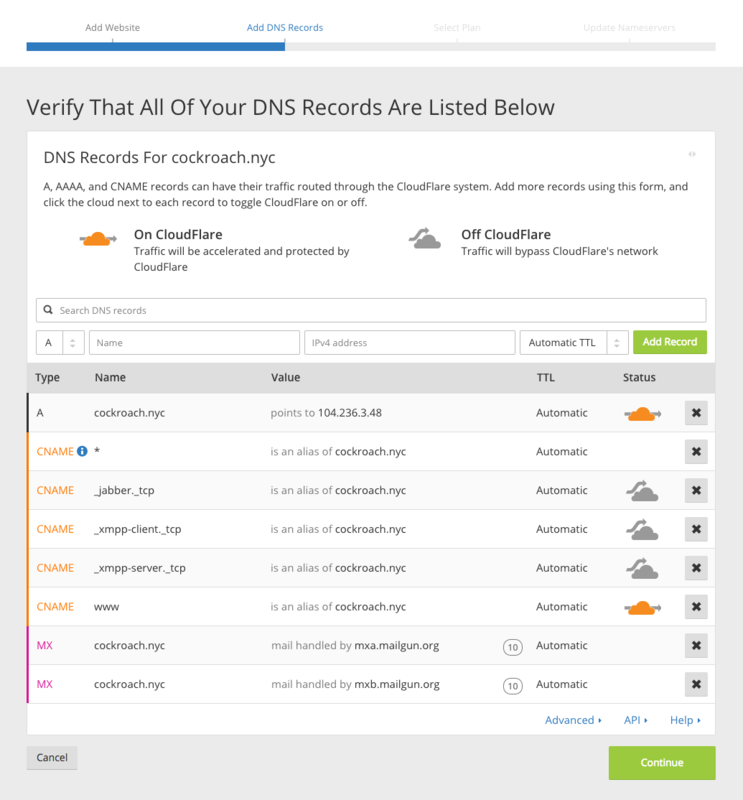 Before using any of CloudFlare's features, you must configure your domain to use CloudFlare's DNS. If you haven't already done so, log in to CloudFlare. This takes about a minute. When it is complete, click the Continue button. Note that, for your A and CNAME records that point to your web server(s), the Status column should have an orange cloud with an arrow going through it. This indicates that the traffic will flow through CloudFlare's reverse proxy before hitting your server(s). To change your domain's nameservers, log in to your domain registrar control panel and make the DNS changes that CloudFlare presented. For example, if you purchased your domain through a registrar like GoDaddy or NameCheap, you will need to log into appropriate registrar's control panel and make the changes there. The process varies based on your particular domain registrar. If you can't figure out how to do this, it is similar to the process described in How to Point to DigitalOcean Nameservers From Common Domain Registrars except you will use the CloudFlare nameservers instead of DigitalOcean's. In the example case, the domain is using DigitalOcean's nameservers and we need to update it to use CloudFlare's DNS. The domain was registered through NameCheap so that's where we should go to update the nameservers. When you are finished changing your nameservers, click the Continue button. It can take up to 24 hours for the nameservers to switch but it usually only takes several minutes. The Pending status means that CloudFlare is waiting for the nameservers to update to the ones that it prescribed (e.g. olga.ns.cloudflare.com and rob.ns.cloudflare.com). If you changed your domain's nameservers, all you have to do is wait and check back later for an Active status. If you click the Recheck Nameservers button or navigate to the CloudFlare dashboard, it will check if the nameservers have updated. This means that CloudFlare is acting as a reverse proxy to your website, and you have access to whichever features are available to the pricing tier that you signed up for. If you're using the free tier, as we are in this tutorial, you will have access some of the features that can improve your site's security, speed, and availability. We won't cover all of the features in this tutorial, as we are focusing on mitigating ongoing DDoS attacks, but they include CDN, SSL, static content caching, a firewall (before the traffic reaches your server), and traffic analytics tools. Also note the Settings Summary, right below your domain will show your website's current security level (medium by default) and some other information. 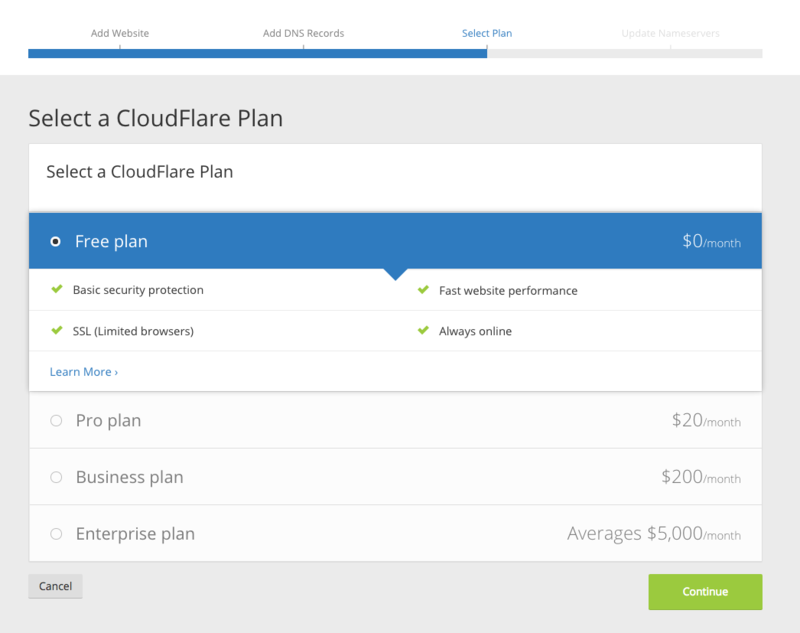 Before continuing, to get the most out of CloudFlare, you will want to follow this guide: Recommended First Steps for All CloudFlare Users. This is important to ensure that CloudFlare will allow legitimate connections from services that you want to allow, and so that your web server logs will show the original visitor IP addresses (instead of CloudFlare's reverse proxy IP addresses). Once you're all set up, let's take a look at the I'm Under Attack Mode setting in the CloudFlare firewall. By default, CloudFlare's firewall security is set to Medium. This offers some protection against visitors who are rated as a moderate threat by presenting them with a challenge page before allowing them to continue to your site. However, if your site is the target of a DDoS attack, that may not be enough to keep your site operational. In this case, the I'm Under Attack Mode might be appropriate for you. 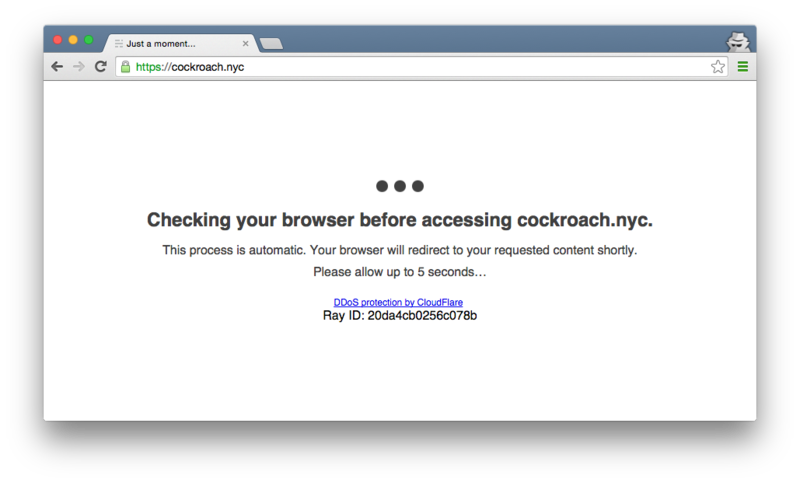 If the checks pass, the visitor will be allowed through to your website. The combination of preventing and delaying malicious visitors from connecting to your site is often enough to keep it up and running, even during a DDoS attack. Keep in mind that you only want to have I'm Under Attack Mode enabled when your site is the victim of a DDoS attack. Otherwise, it should be turned off so it does not delay normal users from accessing your website for no reason. The security settings will immediately switch to I'm Under Attack status. Now, any visitors to your site will be presented with the CloudFlare interstitial page that was described above. Your site should revert back to an Active status, and the DDoS protection page will be disabled.